Ultra Fine Flair: The Most Wonderful Time of the Year! I don't know if I can fully express my love for this holiday (which I would argue should actually BE a national holiday, but then I wouldn't get to draw a spiderweb around my eye - see last year, at right - for work. It's kind of like birthdays - I mean, I understand not wanting to work on one's birthday, but what about all the desky birthday happiness? But I digress). This afternoon I purchased orange lights to deck out the bar of BP:LE (yeah it has a bar, sweet eh?) and my costume is SO AWESOME I can't even believe it - AND it's one of those packaged ones from a Hallowe'en Superstore! I cannot reveal the details yet, but I'm going to an '80s party (at which I was Cyndi Lauper last year - that link is for you, Farlow! 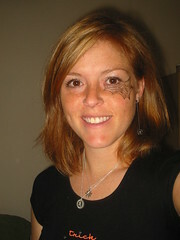 ), and I'm dressing up as someone who has been my nickname since I worked at Corel. Also, my favourite cousin is visiting this weekend! Many pictures to follow. In the meantime, get carving those pumpkins! You're dressing up as a g.? Isn't that a bit risquee?